Pharos Offshore has recently completed the development and enhancement of a 2,500-metre rated SMD-built tracked (or free-flying) jet trencher, which has subsequently been named the UTV400. The 400-hp Trenching ROV (TROV) set the benchmark for cable maintenance scopes when it was first introduced in to the offshore market. 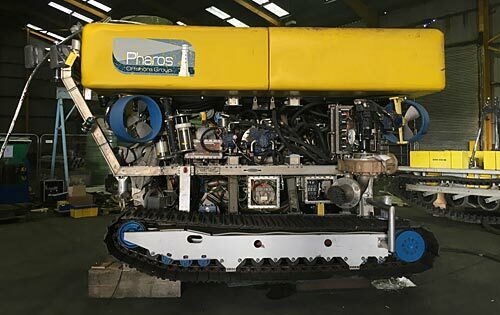 Pharos Offshore have now brought the system back in-line with current working practices by modernising the equipment and doubling the burial capabilities. The system utilises high power to provide numerous inspection, repair and maintenance tasks, with the ability to debury, cut and recover a multitude of subsea products with enhanced efficiency. Offering a trench capability of 2 metres maximum depth, soil dependent, 100 kPa max, the UTV400 tool packages, 1.0/ 1.5 and 2.0 m, can be changed out at sea depending on project requirements and can work to a minimum jetting speed of 100 m/h even in firm seabeds. Integrated surface feed option for operations from 0 to 20 m water depth, the system is capable of performing works from the shore end (5 m WD) right through to 2,500 m water depth. With further development, and an extensive re-engineering programme delivered by Pharos Offshore Group to enhance the systems efficiency, the TROV will now continue to boast its reputation for reliability and performance. The unit has become an essential part of any cable installation or maintenance package due to its small deck requirements and ease of maintenance. Pharos Offshore is able to offer a project package which includes a Sea State 5 launch and recovery crane, now with greater efficiency and burial ability, the system will go on to perform works for Pharos’ clients across the offshore oil, gas, renewable and telecommunications markets on a global scale.